Mayhaps it is just my imagination, but it seems that there has been a passel of news about dinosaur feathers in the news lately. Darwinists cannot give evidence for dinosaur-to-bird evolution, nor can they give a plausible hypothesis for the alleged evolution of the feather itself. Now there is a new problem with pterosaur fuzz. Since the narrative drives the interpretation of the evidence, and Darwinoids see what they want to see, fuzzy areas in fossils are taken to be "feathers", but that claim is not supported. Naturally, the secular science industry press is all atwitter about these alleged feathers. 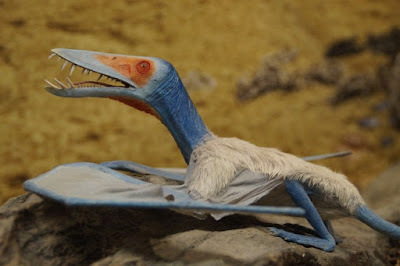 Several problems arise, including how feathers on pterosaurs would mean that feathers were contemporaneous with dinosaurs and predated birds. What next, will they extrapolate to feathered crocodiles? Of course, secularists cannot allow themselves to discard their self-refuting notions and cowboy up to the fact that the world is young, or that dinosaurs, pterosaurs, birds, and everything else were produced by the Creator. Fuzz has been found on a pterosaur. That’s not news. But split ends on some fibers are electrifying the evolutionary imagination. To read the rest, fly on over to "Darwinists Imagine Feathered Crocodiles".